I suppose you could say it’s been years in the making: a gathering of friends old and new within hugging distance. 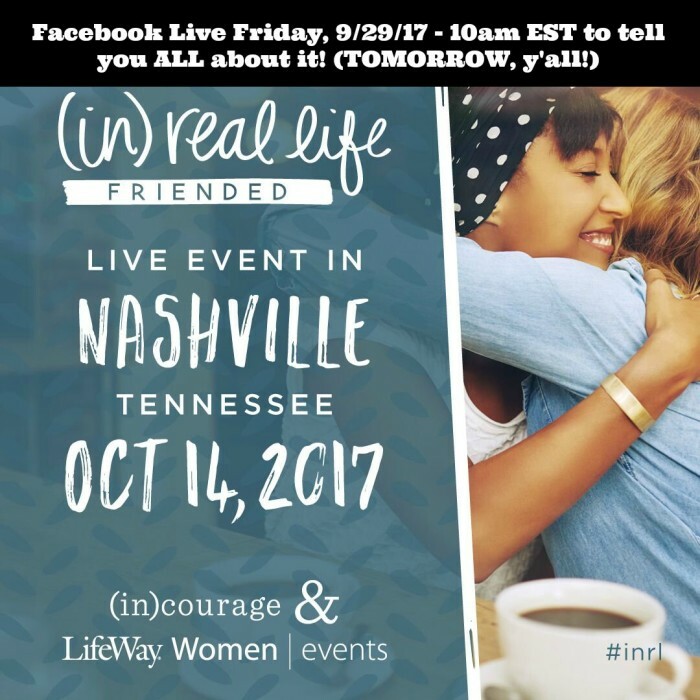 (in)courage and Lifeway have teamed up to bring (in) real life: FRIENDED, “an event for women that unpacks what makes healthy friendships tick.” OF COURSE, our greatest hope is that you can come in person, but because we care so deeply about community, relationship, and the ways women need one another, event planners are offering a simulcast option. The upside? 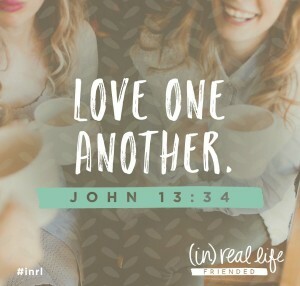 You can bring #inRL to your church, or, if you’re game for the coziest option of them all, from the comfort of your home! The downside? I won’t get to meet you face to face. Boo. Hiss. 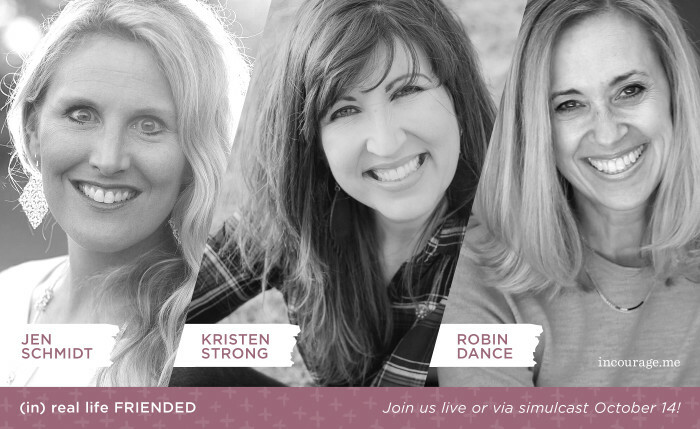 Featured speakers include Lisa-Jo Baker, Chrystal Hurst, and Annie Downs; Meredith Andrews will lead worship; and Jamie Ivey, host of The Happy Hour podcast, will emcee. 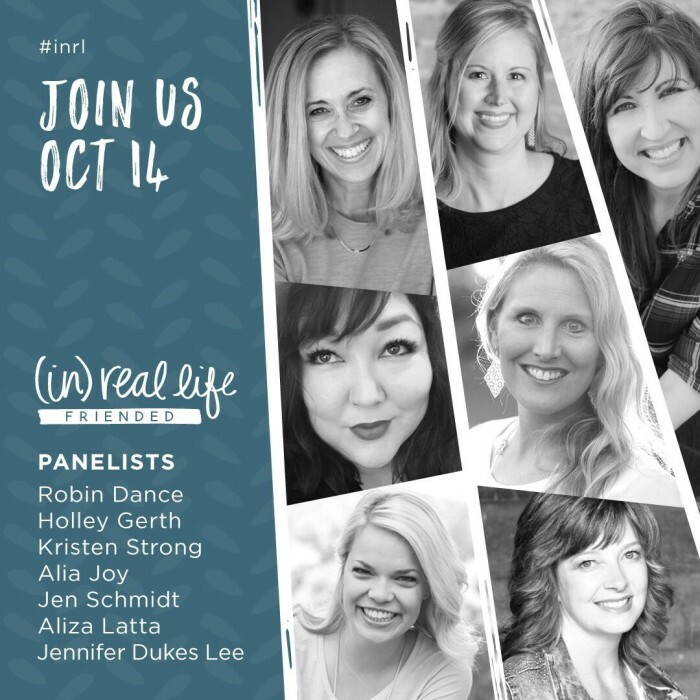 I’m thrilled to join a panel of real-life friends and fellow incourage writers (Holley Gerth, Jennifer Lee, Aliza Latta, Jen Schmidt, Kristen Strong, and Alia Joy Haganbach); we’ll all be sharing a message of hope and encouragement as it relates to friendship, practical calls to action, and personal testimonies about the beauty and brokenness we’ve all experienced with friends. This is an event like no other, one that will have you looking inside and out, and most important of all, looking up to the One who designed us to be in community with one another. It’s going to be special, y’all, and it’s very affordable as far as conferences go (in Nashville AND the simulcast). Please decide right now that you want to take part, whether in Nashville, at your church, or even from home with a few friends. 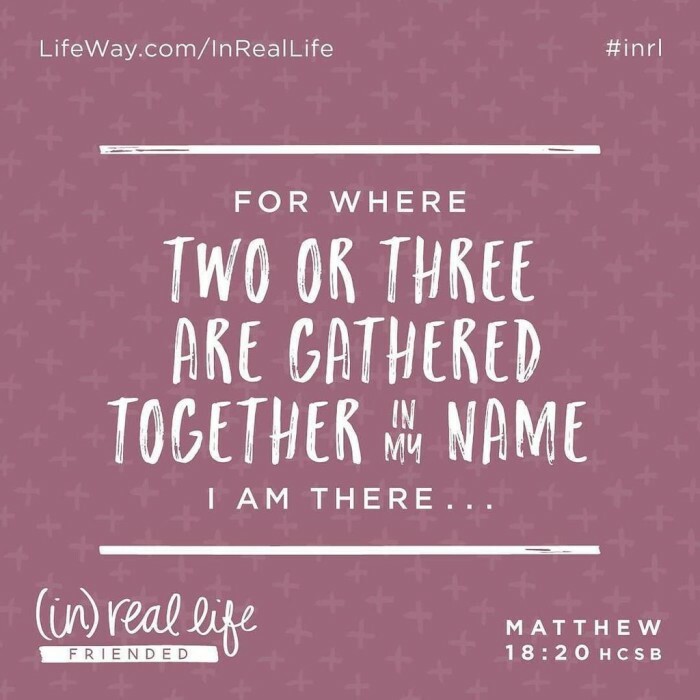 Click the (in) real life: FRIENDED website to find out everything you need to know for each option (plus a bonus add-on for Friday night if you’re able to get to Nashville!). Bring 4 cups chicken broth and ½ teaspoon salt to boil in a saucepan; stir in grits. Cover, reduce heat, and simmer for 20 minutes. Stir together grits, ¾ cup cheddar cheese, and Monterey jack cheese. Melt butter in large skillet over medium heat; add green onions, bell pepper, and garlic; sauté until tender. Stir together green onion mixture, grits mixture, shrimp, and next 3 ingredients. Pour into a lightly-greased 2-quart baking dish. Sprinkle top with remaining ¼ cup cheddar cheese. Bake at 350°F for 30-45 minutes. Leigh actually got the recipe from her friend Lisa; clearly good recipes keep goin’ and goin’, Energizer Bunnies of the culinary world. Using half each of a red and green bell pepper make this dish especially festive at Christmas. Depending on how much heat you like in a dish, you might want to use more cheddar and less jack cheese; or, if you want to add more heat, use Rotel’s spicier version of tomatoes. You can mix up the dish with your favorite cheeses, too. 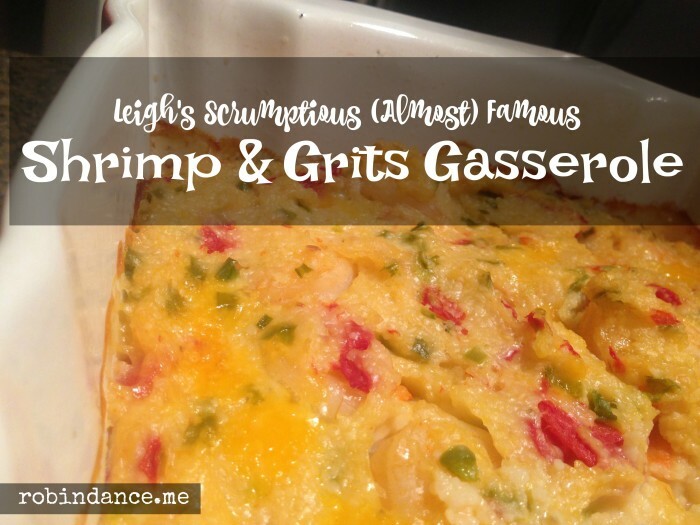 This divides well into two smaller casseroles; keep one and give the other to someone who could use a meal! After we got engaged I couldn’t wait to finally get to choose an everyday china pattern and register for our dishes and gifts. (How in the world was that almost 30 years ago?) I didn’t need to choose fine china; I had inherited my mother’s Malden by Oxford, simple, rimmed in gold, and stunning. I’m one of those who believes kitchen art begins with pretty dishes. 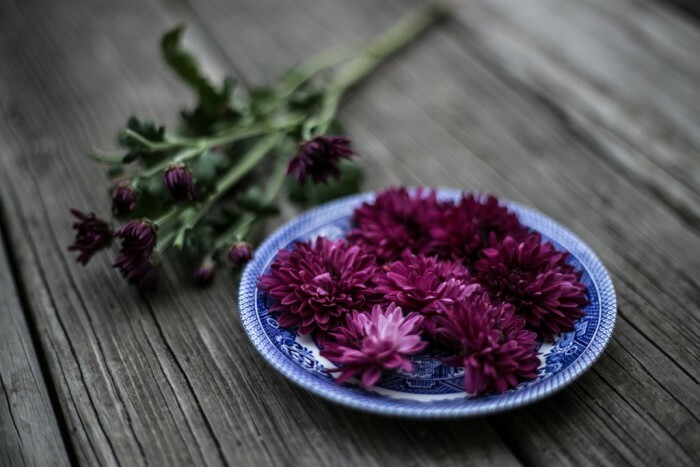 A spectacularly set table doesn’t necessarily have to be fancy and expensive, but with a little thought and intention – flowers and greenery plucked from your yard, handwritten place cards, a centerpiece created with found objects from your home – you can design a masterpiece. I couldn’t wait to begin our life together, to open our home, and experiment with new-to-me recipes. We didn’t have Pinterest or the internet to mine ideas, but we had magazines and the traditions of our own families, plenty to get us started. I’ve always been drawn to color, and my first choice for everyday dishes was Villeroy & Boch’s Fruit Basket; predominately green and yellow, it was just so doggone happy. 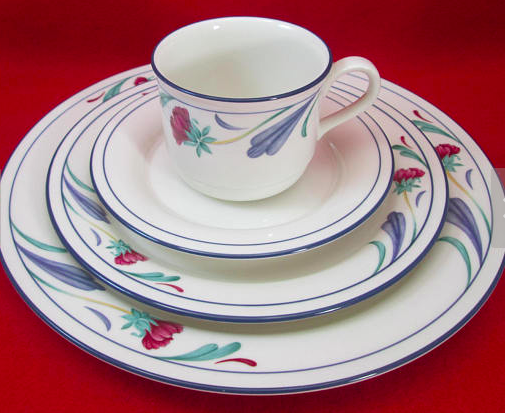 But it was also pricey for an everyday, and sensitive to gift-givers’ budgets, I ended up choosing Poppies on Blue, a popular-in-the-80s Lenox pattern. We received all the place settings we registered for in addition to serving bowls and platters, the cream and sugar, and I think even the salt and pepper shakers. These were the dishes of our newlywed years, a part of countless meals shared with friends and family, and eventually with our own children. Right around the time the poppies began fading, my tastes began changing. With a move from South Carolina to Tennessee, I decided timing was perfect for buying new dishes; this time around, I went with a neutral. When I wanted a splash of color, I’d pick up festive placemats. My once-beloved Poppies on Blue was relegated to a box in the attic, waiting for my children to grow up and move into their own home, or the bigger dream, a heart-secret I’ve held close for all these years. Recently, I enjoyed a girls weekend out of town, and we decided an Airbnb rental would accommodate the space and flexibility we wanted. With many options to choose from, we decided a small, three-bedroom near downtown was best. Our first night there we planned a simple dinner–wine, cheese, fruit and the like, and we began rummaging through cabinets for the dishes we’d need. And then God winked. Twice. Do pop over to Grace Table to see why I can’t help but think God is especially fond of me :). Sometimes He’s kind enough to assure you you’re exactly where you’re supposed to be…. You can’t fool her, you know. Two pudgy hands cup your cheeks to turn your face, demanding your eyes look deep into her own. “Mama, you’re not listening!” You can almost feel her heart stomping its tiny imaginary foot to accentuate the point. Of course, you’re right when you insist, “Yes I am, honey, I can just do two things at once.” You did hear her, after all. But she’s right (more right?) because you weren’t listening. Hearing requires only ears. Listening demands ears, eyes, mind, and maybe most important, heart. Something else is more important than them in that moment. This isn’t confined to children; don’t we all hate it when we know someone is only half engaged in conversation? Present in body but absent in thought? I grow weary from all the admonitions to focus on Christ during the Christmas season, to resist holiday busyness. 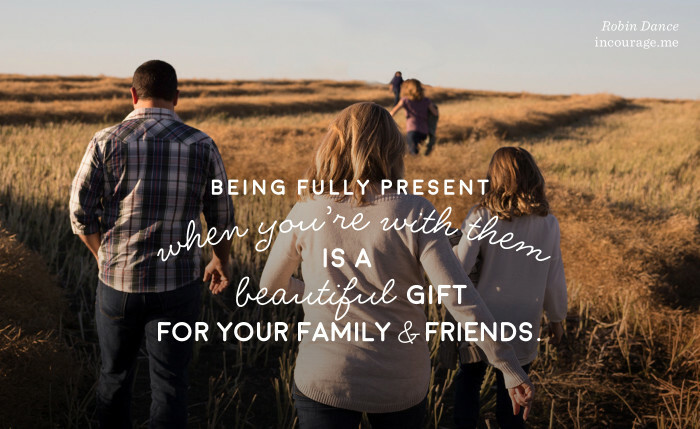 Please don’t get me wrong — I agree — but then I see a believing people tangled and lifeless in sticky-webs of shopping, baking, parties, and school or church programs. Everyone is working extra hard to pay for All The Things. And though our homes have never looked more lovely or smelled more delicious . . .
Our actions are speaking loudly, and they don’t always match up to our words. you’ll be giving and receiving something precious.